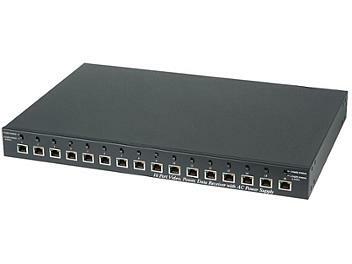 TPP016VPD UTP hub integrate and send video, power, data over one CAT5 cable up to 300 meters. Built in switch at each port to set unit for "2 pair power + 1 pair data" mode or " 3 pairs power" mode. Use with video power transceiver TTP111VP/TTP111VP3 (AC24V camera), TTP111VPC (DC12V camera) at camera side, to send video and power only. Use with TTP111VPD-RJ45 video, power, data combiner at the camera side, to send video, power and data. Built in "no fuse breaker" to avoid current overload. Built in PTC (positive temperature coefficient) for short protection and auto rework on each port.